3.2 "ਵਿਚਾਰਾਂ ਨੂੰ ਖ਼ਤਮ ਕਰਨਾ"
ਸੁਭਾਸ਼ ਚੰਦਰ ਬੋਸ ਨੇ ਕਿਹਾ ਕਿ "ਭਗਤ ਸਿੰਘ ਨੌਜਵਾਨਾਂ ਵਿਚ ਨਵੇਂ ਜਾਗਰਣ ਦਾ ਪ੍ਰਤੀਕ ਬਣ ਗਆ ਹੈ।" ਨਹਿਰੂ ਨੇ ਮੰਨਿਆ ਕਿ ਭਗਤ ਸਿੰਘ ਦੀ ਹਰਮਨਪਿਆਰਤਾ ਇੱਕ ਨਵੇਂ ਕੌਮੀ ਜਾਗਰਣ ਵੱਲ ਵਧ ਰਹੀ ਹੈ ਅਤੇ ਕਿਹਾ:"ਉਹ ਇੱਕ ਸਾਫ ਸੁਥਰਾ ਲੜਾਕੂ ਸੀ ਜੋ ਖੁੱਲ੍ਹੇ ਖੇਤਰ ਵਿੱਚ ਆਪਣੇ ਦੁਸ਼ਮਣ ਦਾ ਸਾਹਮਣਾ ਕਰਦਾ ਸੀ ... ਉਹ ਇੱਕ ਚੰਗਿਆੜੀ ਵਰਗਾ ਸੀ ਜੋ ਥੋੜੇ ਸਮੇਂ ਵਿੱਚ ਇੱਕ ਜਵਾਲਾ ਬਣ ਗਿਆ ਅਤੇ ਦੇਸ਼ ਦੇ ਇੱਕ ਸਿਰੇ ਤੋਂ ਦੂਜੇ ਪਾਸੇ ਦਾ ਹਨ੍ਹੇਰਾ ਦੂਰ ਕੀਤਾ।" ਇੰਟੈਲੀਜੈਂਸ ਬਿਊਰੋ ਦੇ ਡਾਇਰੈਕਟਰ ਸਰ ਹੋਰੇਸ ਵਿਲੀਅਮਸਨ ਨੇ ਫਾਂਸੀ ਦੇਣ ਤੋਂ ਚਾਰ ਸਾਲ ਬਾਅਦ ਲਿਖਿਆ:"ਉਸ ਦੀ ਫੋਟੋ ਹਰ ਸ਼ਹਿਰ ਅਤੇ ਬਸਤੀ ਵਿੱਚ ਵਿਕਰੀ ਲਈ ਸੀ ਅਤੇ ਕੁਝ ਸਮੇਂ ਲਈ ਉਸ ਦੀ ਪ੍ਰਸਿੱਧੀ ਗਾਂਧੀ ਦੇ ਬਰਾਬਰ ਸੀ।"
"ਮੈਂ ਕਾਲਜ ਵਿਚ ਆਪਣੇ ਕੁਝ ਅਧਿਆਪਕਾਂ ਦਾ ਚਹੇਤਾ ਸੀ ਤੇ ਕੁਝ ਮੈਨੂੰ ਨਾਪਸੰਦ ਕਰਦੇ ਸਨ। ਮੈਂ ਬਹੁਤਾ ਪੜਾਕੂ ਨਹੀਂ ਸੀ। ਮੈਂ ਇਕ ਸ਼ਰਮਾਕਲ ਲੜਕਾ ਸੀ ਤੇ ਆਪਣੇ ਭਵਿੱਖ ਬਾਰੇ ਬਹੁਤਾ ਆਸ਼ਾਵਾਦੀ ਨਹੀਂ ਸੀ।"
And wilderness is Paradise now! ↑ Singh, ShahidBhagat. 1 "Auto Biography of Bhagat Singh" Check |url= value (help). 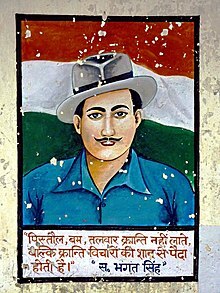 Shahidbhagatsingh.org. ↑ "Nation celebrates Bhagat Singh birthday". ↑ Moffat 2016, pp. 83, 89. ↑ 11.0 11.1 11.2 11.3 Singh, Roopinder (23 March 2011). "Bhagat Singh: The Making of the Revolutionary". The Tribune. India. Archived from the original on 30 September 2015. Retrieved 17 December 2012. ↑ "Bombs Thrown into Assembly". Evening Tribune. 8 April 1930. p. 1. Retrieved 29 August 2013. ↑ "When Jinnah defended Bhagat Singh". The Hindu. Chennai, India. 8 August 2005. Archived from the original on 30 September 2015. Retrieved 2011-10-11. ↑ "ਸਿਂਘ ਦਾ ਭੁੱਖ ਹੜਤਾਲ ਖ਼ਤਮ ਕਰਨਾ". economictimes. Retrieved 23 Mar 2017. ↑ 40.0 40.1 40.2 Lal, Chaman (15 August 2011). "Rare documents on Bhagat Singh's trial and life in jail". The Hindu. Chennai, India. Archived from the original on 30 September 2015. Retrieved 31 October 2011. ↑ Noorani, A.G. (1996). The Trial of Bhagat Singh. Oxford University Press. p. 339. ISBN 978-0195796674. ↑ "Reasons for Refusing to Attend the Court". Archived from the original on 30 September 2015. Retrieved 16 February 2012. ↑ "ਮਦਨ ਮੋਹਨ ਮਾਲਵੀਆ ਦਾ ਇਰਵਿਨ ਅੱਗੇ ਅਪੀਲ ਕਰਨਾ". myindiamyglory.com. 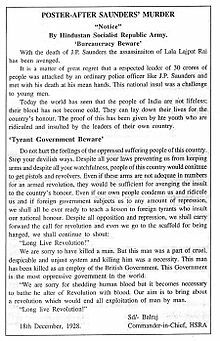 ↑ "Read Bhagat Singh's death warrant on his 84th martyrdom anniversary (updated)". India Today (in ਅੰਗਰੇਜ਼ੀ). Retrieved 23 March 2019. ↑ Khalid, Haroon (March 2010). "In Bhagat Singh's memory". Daily Jang. Archived from the original on 30 September 2015. Retrieved 4 December 2011. ↑ 48.0 48.1 48.2 "National Martyrs Memorial, Hussainiwala". District Administration, Firozepur, Punjab. Archived from the original on 30 September 2015. Retrieved 11 October 2011. ↑ 49.0 49.1 "Supreme Court of India – Photographs of the exhibition on the "Trial of Bhagat Singh"". Supreme Court of India. Supreme Court of India. Archived from the original on 30 September 2015. Retrieved 11 October 2011. ↑ "Bhagat "Indian executions stun the Congress". The New York Times. 25 March 1931. Retrieved 11 October 2011. ↑ "50 die in India riot; Gandhi assaulted as party gathers". The New York Times. 26 March 1931. Retrieved 2011-10-11. ↑ "India: Naked to Buckingham Palace". Time. 6 April 1931. p. 3. Archived from the original on 30 September 2015. Retrieved 11 October 2011. ↑ "Bhagat Singh". Research, Reference and Training Division, Ministry of Information and Broadcasting, Government of India, New Delhi. Archived from the original on 30 September 2015. Retrieved 2012-01-13. ↑ 54.0 54.1 Datta, V.N. (27 July 2008). "Mahatma and the Martyr". The Tribune. India. Archived from the original on 30 September 2015. Retrieved 28 October 2011. ↑ Suthra, Varun (16 December 2012). "Gandhiji tried hard to save Bhagat Singh". The Tribune. India. Archived from the original on 30 September 2015. Retrieved 14 January 2012. ↑ Sachar, Rajindar (17 May 2008). "Death to the death penalty". Tehelka. Archived from the original on 13 September 2012. Retrieved 1 November 2011. ↑ Puri, Harish K. (2008). "The Influence of Ghadar Movement on Bhagat Singh's Thought and Action" (PDF). Journal of Pakistan Vision. 9 (2). Archived from the original (PDF) on 30 September 2015. Retrieved 18 November 2011. ↑ Singh, Bhagat. "To Young Political Workers". Marxists.org. Archived from the original on 1 October 2015. Retrieved 13 February 2015. ↑ 61.0 61.1 "Bhagat Singh an early Marxist, says Panikkar". The Hindu. Chennai, India. 14 October 2007. Archived from the original on 15 January 2008. Retrieved 1 January 2008. ↑ Chinmohan Sehanavis. "Impact of Lenin on Bhagat Singh's Life". Mainstream Weekly. Archived from the original on 30 September 2015. Retrieved 28 October 2011. ↑ "Why I am an Atheist". marxists. ↑ "Leaflet thrown in the Central Assembly Hall, New Delhi at the time of the throwing bombs.". Letters, Writings and Statements of Shaheed Bhagat Singh and his Copatriots. 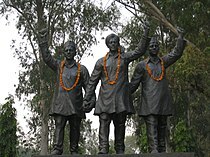 Shahid Bhagat Singh Research Committee, Ludhiana. Archived from the original on 30 September 2015. Retrieved 11 October 2011. ↑ Philipose, Pamela (10 September 2011). "Is this real justice?". The Hindu. Chennai, India. Archived from the original on 1 October 2015. Retrieved 20 November 2011. ↑ "ਭਗਤ ਸਿੰਘ ਬਾਰੇ ਇੰਟੈਲੀਜੈਂਸ ਬਿਊਰੋ ਦੇ ਡਾਇਰੈਕਟਰ, ਸਰ ਹੋਰੇਸ ਵਿਲੀਅਮਸਨ ਦੇ ਵਿਚਾਰ". newsclick. newsclick. 28 Sep 2016. Retrieved 28 Sep 2016. ↑ Singh, Pritam (24 September 2008). "Book review: Why the Story of Bhagat Singh Remains on the Margins?". Archived from the original on 1 October 2015. Retrieved 2011-10-29. ↑ Tandon, Aditi (8 August 2008). "Prez to unveil martyr's 'turbaned' statue". The Tribune. India. Archived from the original on 1 October 2015. Retrieved 29 October 2011. ↑ "Bhagat Singh and B.K. Dutt". Rajya Sabha, Parliament of India. Archived from the original on 1 October 2015. Retrieved 3 December 2011. ↑ 73.0 73.1 "Shaheedon ki dharti". The Tribune. India. 3 July 1999. Archived from the original on 1 October 2015. Retrieved 11 October 2011. ↑ Bains, K.S. (23 September 2007). "Making of a memorial". The Tribune. India. Archived from the original on 1 October 2015. Retrieved 21 October 2011. ↑ "Retreat ceremony at Hussainiwala (Indo-Pak Border)". District Administration Ferozepur, Government of Punjab. Retrieved 21 October 2011. ↑ "Dress and Ornaments". Gazetteer of India, Punjab, Firozpur (First Edition). Department of Revenue, Rehabilitation and Disaster Management, Government of Punjab. 1983. Archived from the original on 1 October 2015. Retrieved 21 October 2011. ↑ Parkash, Chander (23 March 2011). "National Monument Status Eludes Building". The Tribune. India. Archived from the original on 1 October 2015. Retrieved 29 October 2011. ↑ 79.0 79.1 Dhaliwal, Sarbjit; Amarjit Thind (23 March 2011). "Policemen make a beeline for museum". The Tribune. India. Archived from the original on 1 October 2015. Retrieved 29 October 2011. ↑ "Chapter XIV (f)". Gazetteer Jalandhar. Department of Revenue, Rehabilitation and Disaster Management, Government of Punjab. Archived from the original on 1 October 2015. Retrieved 21 October 2011. ↑ "Chapter XV". Gazetteer Nawanshahr. Department of Revenue, Rehabilitation and Disaster Management, Government of Punjab. Archived from the original on 1 October 2015. Retrieved 21 October 2011. ↑ "Bhagat Singh memorial in native village gets go ahead". Indo-Asian News Service. 30 January 2009. Archived from the original on 1 October 2015. Retrieved 22 March 2011. ↑ Ravinder, Sharmila (13 October 2011). "Bhagat Singh, the eternal youth icon". The Times of India. Archived from the original on 1 October 2015. Retrieved 4 December 2011. ↑ Sharma, Amit (28 September 2011). "Bhagat Singh: Hero then, hero now". The Tribune. India. Archived from the original on 1 October 2015. Retrieved 4 December 2011. ↑ Sharma, Amit (28 September 2011). "We salute the great martyr Bhagat Singh". The Tribune. India. Archived from the original on 1 October 2015. Retrieved 4 December 2011. ↑ Prasannarajan, S. (11 April 2008). "60 greatest Indians". India Today. Archived from the original on 1 October 2015. Retrieved 7 December 2011. ↑ "In memory of Bhagat Singh". The Tribune. India. 1 January 2007. Archived from the original on 1 October 2015. Retrieved 28 October 2011. ↑ "Tributes to Martyrs Bhagat Singh, Raj Guru and Sukhdev" (PDF). Rajya Sabha, Parliament of India. 23 March 2001. Archived from the original (PDF) on 26 April 2012. Retrieved 3 December 2011. ↑ "Tributes to Martyrs Bhagat Singh, Raj Guru and Sukhdev" (PDF). Rajya Sabha, Parliament of India. 23 March 2005. Archived from the original (PDF) on 26 April 2012. Retrieved 3 December 2011. ↑ "Bhagat Singh: 'Plan to rename chowk not dropped, just on hold'". The Express Tribune. 18 December 2012. Archived from the original on 1 October 2015. Retrieved 26 December 2012. ↑ Joshua, Anita (30 September 2012). "It's now Bhagat Singh Chowk in Lahore". The Hindu. Chennai, India. Archived from the original on 1 October 2015. Retrieved 2 October 2012. ↑ "Plea to prove Bhagat's innocence: Pak-based body wants speedy hearing". Hindustan Times. 6 September 2015. Archived from the original on 8 September 2015. Retrieved 8 September 2015. ↑ "Dara Singh's best Bollywood moments: Amar Shaheed Bhagat Singh". 12 July 2012. Retrieved 1 July 2018. ↑ "Bhagat Singh death anniversary: 7 movies based on the life of Bhagat Singh". Retrieved 22 March 2018. ↑ Vijayakar, Rajiv (19 March 2010). "Pictures of Patriotism". Screen. Archived from the original on 9 August 2010. Retrieved 29 October 2011. ↑ ਭਗਤ ਸਿੰਘ ਦੀ ਕਲਮ ਤੋਂ. "ਅਛੂਤ ਦਾ ਸਵਾਲ". ਪੰਜਾਬੀ ਟ੍ਰਿਬਿਊਨ. ↑ "ਚਿੱਠੀ ਜੋ ਭਗਤ ਸਿੰਘ, ਰਾਜਗੁਰੂ, ਸੁਖਦੇਵ ਨੇ ਪੰਜਾਬ ਦੇ ਗਵਰਨਰ ਨੂੰ ਲਿਖੀ - Tribune Punjabi". Tribune Punjabi (in ਅੰਗਰੇਜ਼ੀ). 2010-03-23. Retrieved 2018-11-17. ↑ "Jail Note Book of Shahid Bhagat Singh". 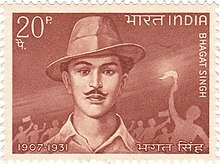 shahidbhagatsingh.org. Retrieved 18 October 2016. ↑ "The Tribune - Magazine section - Saturday Extra". tribuneindia.com. Retrieved 18 October 2016. MacLean, Kama (2015). A revolutionary history of interwar India : violence, image, voice and text. New York: OUP. ISBN 978-0190217150. Nair, Neeti (2011). Changing Homelands. Harvard University Press. ISBN 978-0-674-05779-1. Noorani, Abdul Gafoor Abdul Majeed (2001) . The Trial of Bhagat Singh: Politics of Justice. Oxford University Press. ISBN 978-0-19-579667-4. Sharma, Shalini (2010). Radical Politics in Colonial Punjab: Governance and Sedition. London: Routledge. ISBN 978-0415456883. Singh, Randhir; Singh, Trilochan (1993). Autobiography of Bhai Sahib Randhir Singh: freedom fighter, reformer, theologian, saint and hero of Lahore conspiracy case, first prisoner of Gurdwara reform movement. Bhai Sahib Randhir Singh Trust. Waraich, Malwinder Jit Singh (2007). Bhagat Singh: The Eternal Rebel. Delhi: Publications Division. ISBN 978-8123014814. Waraich, Malwinder Jit Singh; Sidhu, Gurdev Dingh (2005). The hanging of Bhagat Singh : complete judgement and other documents. Chandigarh: Unistar.